"She's a woman who is seven months pregnant and she has been pursued and vilified and chased in the same way that Diana was and it's history repeating itself." "We've seen how that ends," Clooney said, Who magazine reported, in reference to Princess Diana's fatal car crash in 1997 during which she was being cashed by paparazzi. 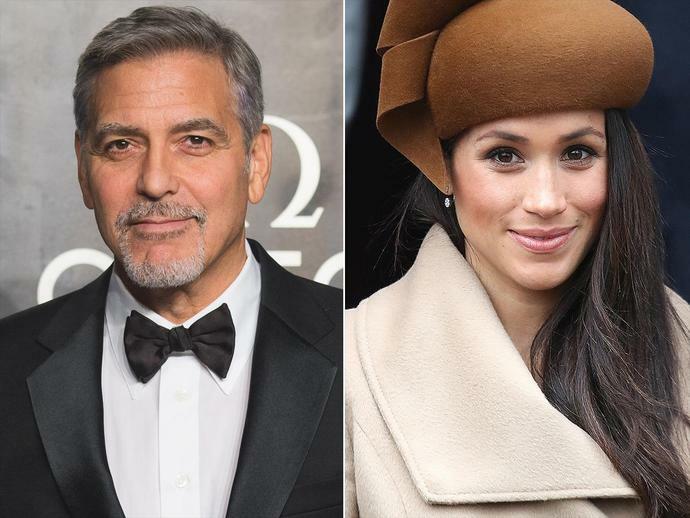 On a much lighter note, Clooney, who attended Meghan and Prince Harry's May wedding with wife Amal Clooney, did reveal whether or not he will be the new royal baby's godfather. "Oh yes, I'll be godfather of the royals apparently," Clooney told reporters before clarifying he was joking with an emphatic, "No!" "I'm a father of twins, I have enough sh- to deal with - literally!" Clooney said, according to the outlet. Clooney isn't the only close friend of Meghan to come to her defense. After maintaining their silence for nearly two years, five women who form an essential part of Meghan's inner circle have spoken with PEOPLE to "stand up against the global bullying we are seeing and speak the truth about our friend," says a longtime friend and former costar. "Meg has silently sat back and endured the lies and untruths," her former costar says in PEOPLE's cover story last week. With Meghan and Harry expecting their first child this spring, "we worry about what this is doing to her and the baby," adds the costar. "It's wrong to put anyone under this level of emotional trauma, let alone when they're pregnant." Despite the dramatic changes in her life, Meghan's friends say she's remained true to herself. A friend from L.A. recalls visiting Kensington Palace's Nottingham cottage, sharing, "We had a couple of days together recently. Her husband was out of town on work. In the room she made up for me, there was a candle lit by the bed, slippers and a robe. We were the only two in the house. It was our time. She made the most lovely meals. She made tea every day. It was raining and muddy outside, so the dogs got all dirty, and she's wiping them off with towels. How much she loves her animals, how much she loves her friends, how much she loves feeding you, taking care of you - none of that has changed." "When you see her at walkabouts, when she crouches down to talk to the kids and genuinely has real conversations with people, that's Meg," says her former costar. Clooney's Catch-22, which he also executive produces, airs on Hulu starting May 17. All six episodes - including the two he directed - will be available to watch all at once. The series also stars Christopher Abbott, 32, who got his start on HBO's Girls, as the main character, John Yossarian, and Kyle Chandler, 53, from Friday Night Lights, who plays Colonel Cathcart.